It’s summer! In Japan, that means muggy heat, fireworks, and cold noodles. 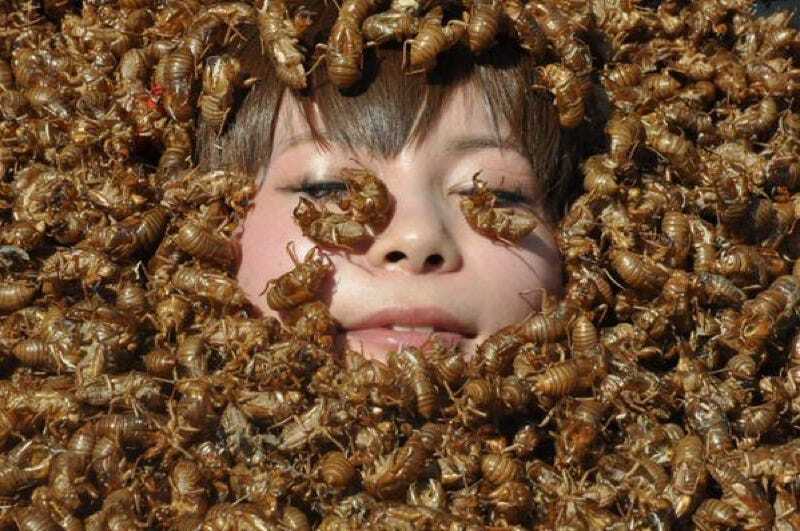 But for one Japanese celeb, it also means covering oneself in insect shells. Note: Some readers might get grossed out by these images. I know I kinda did. Shoko Nakagawa—singer, TV personality, and reigning Pokémon queen—has been covering herself with cicada husks for the past few years, uploading the images to Twitter. In late July and early August, you can hear cicada (セミ or semi) throughout Japan. It’s one way you know it’s summer. Online in Japan, this is the Twitter equivalent of marking the season. Just as it wouldn’t be summer in Japan without cicada chirping, it wouldn’t be summer in Japan without Shoko Nakagawa covering herself in cicada shells. First, she uploaded this photo, which seemed rather whatever. No biggie! Then, she went and outdid herself by posting these photos. Now you know what one thousand cicada husks look like on a famous celebrity. And this happened during one of her concerts.